Tag Archives: I DON’T FEEL SAFE FROM THAT LUNATIC! 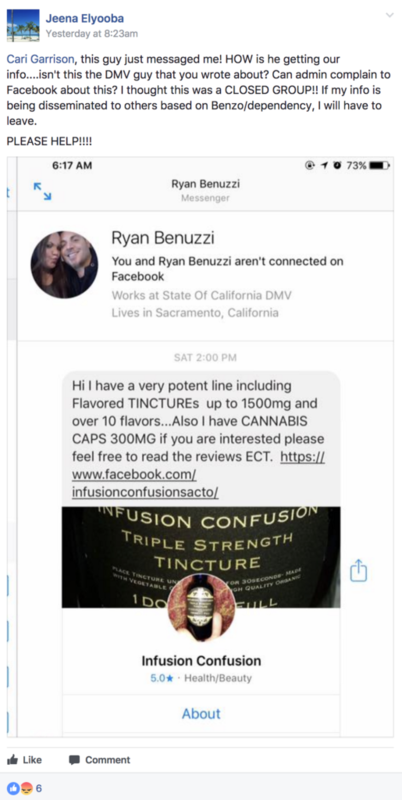 Facebook benzo groups penetrated by hackers? hey, i think sometimes its easier to relate to people when you actually chit chat on the phone. if anyone needs to talk, feel free to give me a call, i think it would therapeutic, i went to an anxiety meeting and found it to help me so much when i could talk to someone about my issues. its hard to find someone who understands. i know my wife doesn’t understand nor my family. so i welcome anyone, 305-305-2923. I’m not a weirdo, lol, google me if you’d like, jase haber. Where do you live? I am in the U.S. Will this be an out of country call? no i am in miami…. Can I call you right now? It’s against BB rules to give out personal information such as your name and phone number and to solicit phone calls. I did Google you and what I found was ***NOT*** very complementary at all. I would strongly caution all members! For your own safety, do not attempt to contact this person! Please do not do this again. If you do, you risk not being able to post freely as a result. First and foremost I had no idea this was against the rules, I don’t see anything so wrong with putting out my phone number as long as it’s in the attempt to communicate with people and help each other out. I happened to have had a great conversation with somebody that could relate to me. I apologize for offending so many of you. When this is a form this design to help each other. Sometimes it’s very difficult for me and I’m sure for others to wait for somebody to respond to a reply when they’re at that particular moment going to pure panic. Didn’t see it at such a big deal, I have no issues of anyone knowing who I am since I can be publicly looked at the Google, and I’m actually considered a public figure. Sometimes it’s very difficult for me and I’m sure for others to wait for somebody to respond to a reply when they’re at that particular moment going to pure panic. Didn’t see it at such a big deal, I have no issues of anyone knowing who I am since I can be publicly looked at the Google, and I’m actually considered a public figure. I’m not by any means ashamed of what I’m going through and have no issues helping other people that are in the same situation as I am. But again I apologize if I’ve violated the rules and any which way. But once again, I’m giving out my phone number not anyone else’s. My personal information no one else’s, it’s up to that person whether they need somebody to talk to them or not. I was really under the impression this was a form to help each other out, and I’m actually glad I put my phone number because I got to meet someone that was very cool and we happen to have a lot in common and are going to similar situations, as well as I’ve met somebody prior to that who has help me through this whole process. But I will make sure not to post it again since it’s obviously against the rules. You googled me, you would see I’m a successful actor as well as business man. So please do not even think for one minute you know me. Unfortunately, like the wider Internet, BenzoBuddies is not immune from those who would seek to misrepresent themselves as counsellors, doctors, confidants, etc. We have suffered our fair share of those whose only motivation in life is the desire to hurt others. It would be fair to describe one or two of these people as unhinged and a menace. Please do not share your contact information and personal details through the PM (Personal Message) system or the open forum. Yes, I Googled you alright, make no mistake about that. Your definition of “success” and “business” is the antithesis of mine. Sad that you’re so proud of your past accomplishments. You go your own way and I’ll go mine. We don’t delete threads that have received replies. It would be best for everyone to just move on now. There are lots of other members who need support and many other threads to post on. I’ve already told you that I did my research. You want me to publish more links here? Of your recent “successes”? “Mistake”. That’s one of my favorite words . A mistake is when one takes a left turn whilst meaning to take a right turn, oops. A mistake is NOT something that you DELIBERATELY CHOOSE, time and time and time again. Pre-meditated “mistakes”? […] is a new member, and whatever failings occurred in his past, he was not hiding them from members since he has posted his real name. He now seems to now understand that because of the potential problem of people seeking to misrepresent themselves at support forums such as BB (to abuse/fleece/trick members), we do not allow personal contact information to be posted here. […] is here for support with his withdrawal from benzodiazepines – members should not judge each other. Unless he does something to prove otherwise, […] should be given the benefit of any doubt, just as we do with all members. After all, we generally do not know the true identity of other members, and all are unvetted. I can vouch for […]. He’s a good person just wanting to help but I can see how the board would be concerned. Not everyone has good intentions. Talking to someone going through the same thing really helps me. What are some good f.b. groups? Author studying cult for new exposé? 1. She has repeatedly stated she is well. 2. She has repeatedly stated she joined this forum because she believed that healed people were few and far between and she therefore had something to offer. 2. She has repeatedly stated she is writing a book on this very topic. Everything she does and says on this forum is for the purposes of her book. She has made it abundantly clear that she doesn’t care what anyone else’s personal experiences are as long as they don’t align with her thoughts, beliefs and experiences. We are all just a means to an end. People who are well get on with their lives, they don’t join a forum AFTER they are well. This forum’s primary purpose is for support getting off. Yes a whole lot of other things too. She is by no means an expert and the advice she is so freely dolling out is not only toxic to me but toxic to everyone else. When she asks questions about you, she isn’t doing it to help you, she is doing it for her book. Opening yourself up to this will prove to be very damaging when you don’t know it’s her motive. She doesn’t care about you that is clear. So please everyone for your sake stop engaging with her and her nonsense!! PS – based on everything she has divulged, I question whether or not she ever had a problem with Benzo’s or Opiates to begin with.